Are Migraines a Side Effect of Mood Swings? Menopause and pregnancy are the two main stages of life that are linked to mood swings, but are migraines a side effect? Mood swings are reported by almost half of all women during the menopausal transition. There are many reasons for mood swings, and many side effects that come with it. 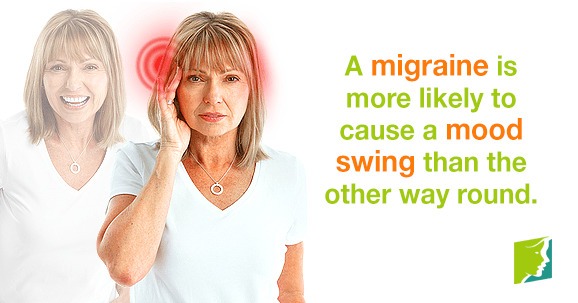 Basically, a migraine is a severe headache that can be a debilitating condition and comes with nausea. They last anywhere from four hours to three days and women are three times more likely to suffer from them than men. Symptoms of migraines can be: sensitivity to light and sound, vomiting, and nausea, and are often the result of normal activity. It's important to remember that hormones often lead to migraines, and the fluctuation in estrogen levels during menopause and ovulation can make you more susceptible to them. What Is the Link Between Mood Swings and Migraines? In fact, migraines are not one of the common symptoms of mood swings and the truth is that a migraine is more likely to cause a mood swing than the other way round. During menopause, your estrogen levels are reduced and, along with many other signs and symptoms, this can cause migraines, which in turn lead to a change in mood. Mood swing symptoms are: emotional, sadness, depression, unmotivated, irritation, impatience, aggressiveness, and stress. While you may have both at the same time, it is more likely a migraine will leads to a mood swing. What Can I Do about Migraines? Tiger balm. Putting a little on your fingertips and rubbing it on either side of your head can relieve pain. Honey. Spoonfuls of honey every 15 minutes are known to relieve migraines. Mustard. Getting strong mustard and smelling it is thought to be a way to deal with migraines. For further information about how to handle mood swings effectively, follow the links below. "Adult Mood Swings". The Health Center. www.thehealthcenter.info. "Estrogen Promotes Gender Difference in Brain's Response to Stress". Molecular Psychiatry. www.psycheducation.org. Some women find herbal remedies helpful when it comes to treating menopausal mood swings. Keep reading to learn what herbs can help and how. It turns out that consuming a little bit of dark chocolate can actually help alleviate mood swing symptoms. Learn how here.